Now that winter is saying its (long) goodbye and spring is beginning to sprout, you may have noticed changes in your skin. Cold, dry months can take their toll, often leaving skin rough, pale, and less-than its perky best. Good thing there are simple ways to repair skin damage naturally and breathe fresh life back into your complexion. Using the right ingredients and making a few adjustments to your beauty routine will make dreary winter a distant memory. You’ll be ready for spring and dreaming of summer in no time. A facial masque is more than a once-in-a-while skin treat. Regular use of an organic face mask made with targeted ingredients provides big time beauty benefits to your skin. Choose one designed to put some spring back in your skin. Natural clays lend a detoxifying and smoothing feel and are gentle on winter-ravaged skin. Rosehip oil offers a brightened and even-toned appearance. Antioxidant-rich algae gives skin the feeling of ultimate nourishment while providing a healthy looking glow. For best results, use weekly or whenever skin needs a boost of radiance. Let’s face it, winter stresses out the skin. Dreary days and lack of sunshine can put a strain on good vibes too. Calm your skin and your senses with an indulgent and relaxing aromatherapy bath. A soak in a steamy tub relieves tension, while ingredients like sea salts and essential oils make skin feel super soft and revitalized. Ramp up your self-care regimen by making time for an aromatherapy bath at the end of a long week. Your face isn’t the only part of your body that winter makes rough and dry. The good news? It’s quick and easy to smooth away winter bumps. Use a physical exfoliant made with sugar or grains to gently slough skin smooth. Coffee is another excellent skin smoother and comes with an added bonus - caffeine helps to give skin a tightened look and feel, which is great on areas of cellulite. You may not be lounging near the pool yet, but that doesn’t mean you should skip the sunscreen. UV protection is a year-round necessity for preventing dark spots, discoloration, and premature aging. Apply to all exposed skin each morning before heading out for the day. The easiest way to protect your skin from the sun’s damaging rays? Use a facial moisturizer with SPF. Have you Marie Kondo-ed your closet yet? You probably pack up your winter items once spring arrives and it’s important to do the same with your makeup kit. That’s right, most makeup items come with a six month shelf life after opening and should be replaced twice a year. Take advantage of this beauty kit ‘cleanse’ and select some new colors for spring while you’re at it. Peachy pinks and warm sienna hues are in for this season. You may be able to hide those scaly feet during the winter months, but now it’s time to get your digits warm-weather worthy . The key to keeping hands and feet soft and smooth is a bit of natural exfoliation and consistent use of moisturizing ingredients. Slough with a hand and foot scrub that improves the feel of your rough, callused skin. 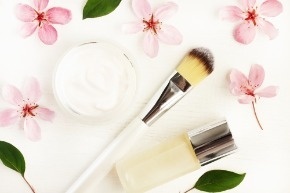 Next, apply a healthy dose of moisture with body cream or balm made with rich butters and oils. Be sure to layer it on at night before going to bed to keep skin feeling soft and silky. Don’t forget your cuticles! Apply cuticle oil as needed to prevent tearing or peeling of that delicate area, then pick out a fresh springy polish to show off your beautiful nails. A few new products, a couple of switches to your beauty routine, and your skin will be ready for spring. Now, treat yourself to a new pair of fancy shades or pretty sandals and enjoy the sunshine!